Quantitative imaging can facilitate patient stratification in clinical trials. The hypoxia-activated prodrug evofosfamide recently failed a phase III trial in pancreatic cancer. However, the study did not attempt to select for patients with hypoxic tumors. We tested the ability of 18F-fluoromisonidazole to predict evofosfamide uptake in an orthotopic xenograft model (BxPC3). Two forms of evofosfamide were used: (1) labeled on the active moiety (3H) and (2) on the hypoxia targeting nitroimidazole group (14C). Tumor uptake of evofosfamide and 18F-fluoromisonidazole was counted ex vivo. Autoradiography of 14C and 18F coupled with pimonidazole immunohistochemistry revealed the spatial distributions of prodrug, radiotracer, and hypoxia. There was significant individual variation in 18F-fluoromisonidazole uptake, and a significant correlation between normalized 18F-fluoromisonidazole and both 3H-labeled and 14C-labeled evofosfamide. 18F-fluoromisonidazole and 14C-evofosfamide both localized in hypoxic regions as identified by pimonidazole. 18F-fluoromisonidazole predicts evofosfamide uptake in a preclinical pancreatic tumor model. Evofosfamide (TH302) is a hypoxia-activated prodrug that showed promise against pancreatic cancer in preclinical and phase II trials [1, 2]. 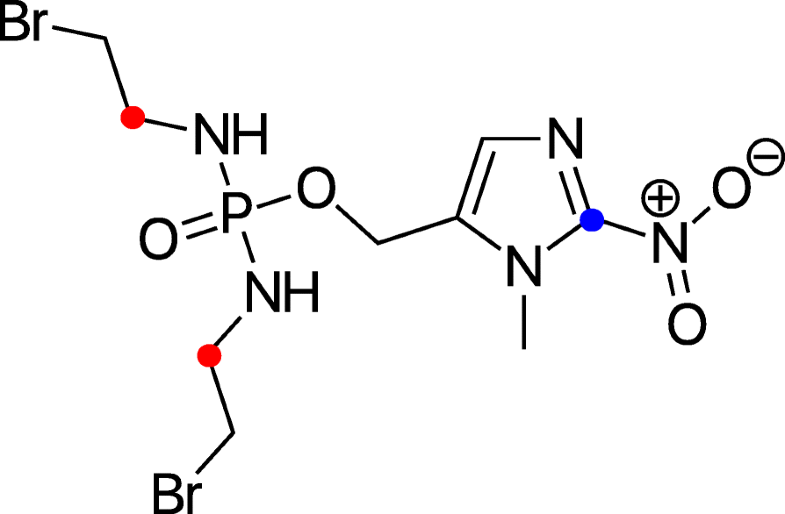 The drug consists of a nitroimidazole moiety linked to a bromo-isophosphoramide mustard (Br-IPM). Enzymatic reduction in the absence of oxygen leads to the cleavage of evofosfamide. Neither the nitroimidazole nor the uncleaved evofosfamide molecule is significantly cytotoxic, but the liberated Br-IPM is diffusible and acts as a cytotoxic agent throughout the tumor. However, in a recent phase III MAESTRO study against pancreatic cancer, evofosfamide narrowly missed its primary endpoint . The study design did not include hypoxia imaging at baseline, leading to the likely inclusion of patients with normoxic tumors that are not expected to benefit from such therapies. While pancreatic cancers are in general expected to be hypoxic , recent imaging studies have shown that not all pancreatic tumors display significant hypoxia [5–7]. In this study, we sought to determine whether 18F-fluoromisonidazole (18F-FMISO) could predict the tumor uptake of evofosfamide in a preclinical pancreatic tumor model, which if true would support the use of hypoxia imaging as way to identify likely drug responsive patients in the treatment population. All animal experiments and procedures were approved by our Institutional Animal Care and Use Committee and complied with the National Institutes of Health regulations on the research use of rodents. Six-week-old-female athymic mice were obtained from Envigo Laboratories (Indianapolis, IN) and maintained according to the Guide for the Care and Use of Laboratory Animals in an AAALAC-approved facility. BxPC3 cells (ATCC, Manassas, VA.) were implanted orthotopically in the pancreas. In preliminary experiments, we established the level of tumor hypoxia in this model through pimonidazole staining (Hypoxyprobe, Burlington, MA.). Six tumors were sectioned at four different depths/tumor. Pimonidazole was given at 100 mg/kg i.p. 1 h before sacrifice and stained as previously described . 18F-fluoromisonidazole was synthesized on site  by the MSKCC Cyclotron and Radiochemistry Service. 14C-evofosfamide and 3H-evofosfamide were supplied by Merck pharmaceuticals (Germany). The 14C label is present on the inactive nitroimidazole ring; the 3H label on the bromo-isophosphoramide mustard (Fig. 1). All injections were intraperitoneal. Mice were co-injected with 18F-fluoromisonidazole and either 3H-evofosfamide and 14C-evofosfamide together (ex vivo counting; n = 20) or 14C-evofosfamide and pimonidazole (autoradiography; n = 3). For ex vivo counting, animals were injected with 3.7–5.6 MBq 18F, 740 kBq 3H, and 370 kBq 14C. For autoradiography, approximately 18.5 MBq 18F was injected per mouse along with 370 kBq 14C. Unlabeled evofosfamide (100 mg/kg) was co-injected with tracers. Two hours after injection, mice were sacrificed and tumors removed. Tumors were either frozen and prepared for autoradiography and pimonidazole immunohistochemistry, or weighed, counted for 18F, and digested in Scintigest (Fisher Scientific, NJ)/hydrogen peroxide for counting on a liquid scintillation counter. Activity was expressed relative to sample weight and injected dose, and normalized to the tumor with the lowest 14C uptake. 18F and 14C images were obtained by a two-exposure technique. The first, which was obtained immediately post sacrifice, was for 2 h and provides a signal dominated by the 18F. The second (for 14 days) was captured after complete decay of the 18F and reveals the distribution of the 14C. Autoradiographic and immunohistochemical images were co-registered with fiduciary markers as previously described . The correlation strength between indices was analyzed using Pearson’s r. For that purpose, autoradiography images were downsampled to 1 pixel = 0.1 mm. p < 0.05 was assumed to represent statistical significance. In preliminary experiments, we found substantial inter-tumor variation in the pimonidazole positive fraction in the BxPC3 model (mean = 0.18, range = 0.09–0.30; n = 6) as quantified by Otsu thresholding (Each tumor was assessed at four depths, separated by 1 mm. Necrotic tissue was excluded based on hematoxylin and eosin staining.). Based on this, we co-administered 18F-fluoromisonidazole, 14C-evofosfamide, 3H-evofosfamide, and unlabeled evofosfamide in a therapy dose to 20 tumor-bearing mice. Observed inter-tumor variation in normalized 18F-fluoromisonidazole counts correlated significantly with both 14C-evofosfamide and 3H-evofosfamide uptake (r = 0.63 and 0.54, respectively, p ≤ 0.01; Fig. 2). The correlation between 14C-evofosfamide and 3H-evofosfamide was 0.81 (p < 0.01). Digital autoradiography helped clarify the scatter plots. 18F-fluoromisonidazole and 14C-evofosfamide both preferentially accumulated in hypoxic regions as identified by immunofluorescence staining for pimonidazole (Fig. 3; the higher resolution of the 14C image is due to the lower energy and consequent shorter path length of 14C β particles). 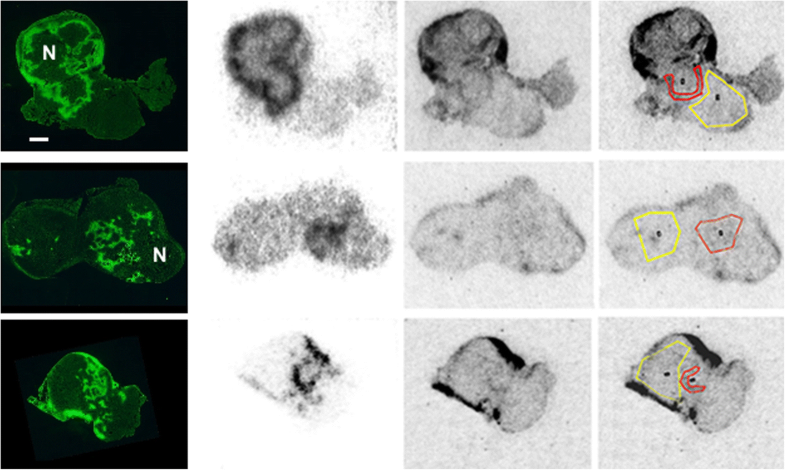 Pearson’s correlation between downsampled autoradiography images showing uptake patterns of 18F-fluoromisonidazole and 14C-evofosfamide was 0.62, 0.19, and 0.59 for the three tumor sections, respectively. Activity in 14C hotspots was 52% greater than the bulk of the viable tissue. In the matched regions of the 18F images, activity was 4.4 times greater than adjacent tissue. The objective of this study was to examine whether 18F-fluoromisonidazole could predict the tumor uptake of evofosfamide in a preclinical pancreatic tumor model. Our findings confirmed a linear correlation between 18F-fluoromisonidazole over the concentration range studied, supporting the notion that 18F-fluoromisonidazole could stratify a patient population according to those most likely to benefit from evofosfamide therapy. In all investigated tumors, 18F-fluoromisonidazole localized in the hypoxic regions as identified by pimonidazole staining, and digital autoradiography revealed co-localization between 18F-fluoromisonidazole and 14C-evofosfamide. The dynamic range of the 14C-evofosfamide signal was lower than 18F-fluoromisonidazole, a possible consequence of saturation of the reductases at therapy-associated concentrations of the drug. However, in mice, multiple low doses of evofosfamide were not more effective than single high doses . The reduced sensitivity of evofosfamide uptake to hypoxia could account for the regression slope being less than one and might relate to the large dose of drug saturating the enzyme reduction system. This is supported by the fact that the spatial match between evofosfamide and pimonidazole was much closer when only tracer doses of evofosfamide were given (data not shown). The status of evofosfamide is now in considerable doubt given the outcome of the recent MAESTRO trial, which indicated a modest benefit for evofosfamide combined with gemcitabine compared with gemcitabine alone in patients with unresectable locally advanced or metastatic pancreatic ductal adenocarcinoma, causing the sponsoring company to abandon the drug. Based on the reported range of tumor hypoxia in patients with pancreatic cancer , it is highly likely that the trial population would have included non-hypoxic tumors and that these individuals would potentially have masked the benefit of evofosfamide. Such an effect was shown with tirapazamine, an earlier hypoxia-activated prodrug, where a retrospective analysis demonstrated a significant advantage for the drug in head and neck disease, but only for patients with hypoxic tumors as assessed by 18F-fluoromisonidazole PET . Our results suggest that 18F-fluoromisonidazole could have provided similar information for the evofosfamide trial. 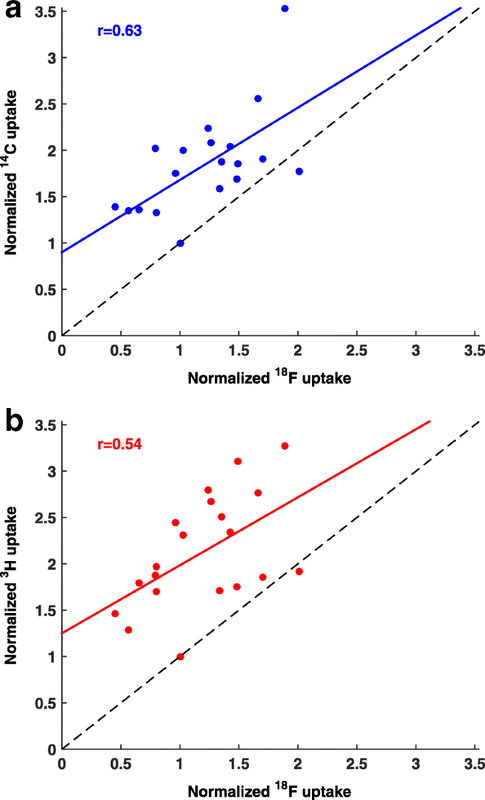 Uptake and distribution of 18F-fluoromisonidazole and evofosfamide correlate in vivo on both whole-tumor and microscopic levels, indicating a potential for the use of 18F-fluoromisonidazole as a quantitative biomarker of evofosfamide uptake in pancreatic tumors. This study was supported by the NIH grants 1 R01 CA194321-01A1 (P.I. John L. Humm) and the center core grant P30 CA008748 (P.I. Craig B. Thompson). MG planned the study, carried out the experiments, and drafted the manuscript. LF participated in performing the experiments. NVKP performed the radiochemistry. JR planned the study, carried out the experiments, and helped to draft the manuscript. JLH conceived of the study and participated in its design and coordination. All authors read, contributed to, and approved the final manuscript. All applicable international, national, and/or institutional (The Institutional Review Board at Memorial Sloan Kettering Cancer Center) guidelines for the care and use of animals were followed. This article does not contain any studies with human participants performed by any of the authors.